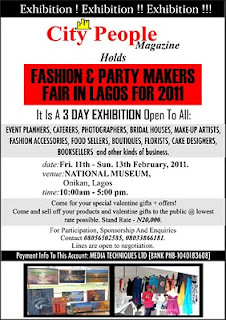 CITY PEOPLE MAGAZINE HOLDS FASHION AND PARTY MAKERS FAIR IN LAGOS. The City People Fashion and Party Makers Fair is going to be a major exhibition which will display trends in the Fashion, Beauty and Event Industry. A unique event organized by the City People Media Group will hold at the National Museum, Lagos from Friday 11 to Sunday 13 February, 2011. The exhibition brings together Event Planners, Caters, Photographers, Bridal Houses, Make-up artists, Fashion Accessories, Food Sellers, Boutiques, Florists, Cake Designers, Book Sellers and other kinds of business under one roof. The exhibition provide the opportunity to the participants to present their services and products in one place to their future customers, and generally to create useful business contacts. And it also allow the general public to get the special valentine gifts and offers at the lowest rates. The 3 days exhibition will be taking place at the premises of the National Museum, Onikan, Lagos. This event promises to big in all ramifications; that is why the organizers had to look for a venue that will be suitable for the plans and arrangement made towards the success of this event. The National Museum occupies a position on Lagos Island in the centre of the city. It one venue that has hosted many major exhibition and events in recent time. It has an exciting and unprecedented platform for exhibitions. It is well equipped with facilities that will make any event comfortable and convenient, some of which include good parking space, spacious premises and a host of others. It is also easily accessible irrespective of where you are coming from. The fair which will be kicking off on Friday February 11, 2011 will be declared opened by a special guest of honor. indomie red hot jam concert in nigeria.